The newly adopted energy efficiency directive (2012/27/EU) highlights the importance of energy efficiency in reaching the Union’s 2020 targets. We, the EnercitEE partners, set our sights on preparing regions and cities to comply with future energy efficiency requirements, as well as on understanding other regional and local approaches within Europe, exchanging experiences and, in the end, helping build a joint European energy market. After 4 years a successful and result oriented project will come to an end in December 2013. 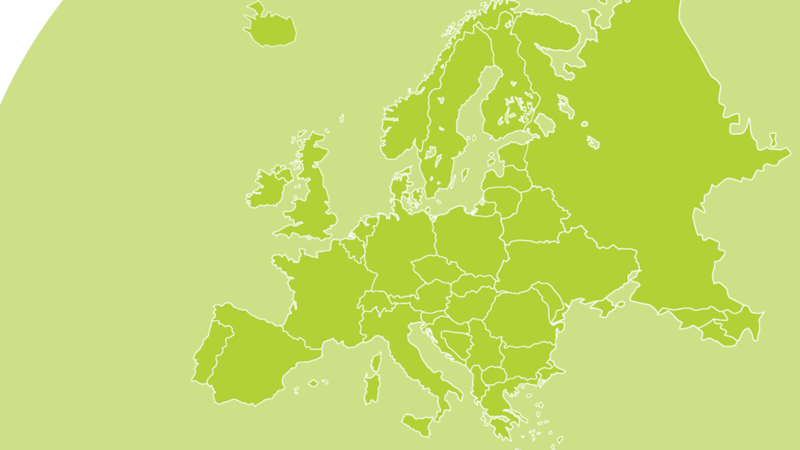 5 European regions: Saxony, Southeast Sweden, Haute-Savoie, Emilia Romagna and Lower Silesia have contributed a great deal to improve energy efficiency. On 25th September 2013 EnercitEE’s final conference took place in the Saxony Liaison Office in Brussels. About 100 guests from DG Energy, the European Parliament, from many regional liaison offices and federations joined the EnercitEE partners, listened to their experiences made, to the good practices presented and discussed the results with them. Monika Hoegen, an independent Brussels and Cologne-based journalist invited all guests to join her and the EnercitEE partners on a journey through Europe and the 5 EnercitEE regions Saxony, Smaland, Emilia-Romagna, Haute-Savoie and Lower Silesia showing the implementation of EU energy directives into regional policies and practices as well as giving practical implementation examples. All partners concluded at the end of the day that the final conference has been successful and hopefully the results presented will find their way into many other European regions. For more information on the final conference and its presentations please click here. Working together with other regions really opens your eyes. Swedes have a tendency to think they already have the best solutions and systems. In EnercitEE we learned a lot about new solutions and methods and also compared policies. For example we realised that the Swedish building regulation is unbelievably weak compared to other countries and it was even questioned if it complies the building directive. Another eye-opener was the well-developed communication projects that were introduced as sub-projects to EnercitEE. The exchange of information and experience in the sub-projects really made us take a big leap forward. The sub-projects were also an efficient way to make local level participate in EU-projects, which they normally find too difficult to administrate. In EnercitEE, we could assist them. The Good Practice Guide has become an important source of information and inspiration in the region. Another important tool for the local level is the Handbook on climate planning that was developed in one of the sub-projects. It shows how to plan both for mitigation and adaptation to climate change. It has also been very interesting to learn more about the situation in different countries and we realise how important the structural funds are to bridge the gaps and make EU more coherent. To learn from other European regions and to share existing knowledge - this was Saxony´s motivation to participate in an INTERREG IVC project. A four year project provides excellent opportunities to work intensively on the topic chosen. 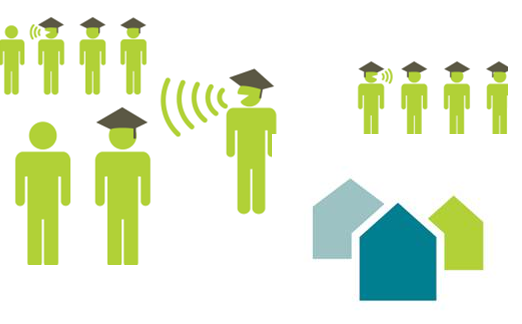 Further, as EnercitEE was established as a mini-program, it allowed accompanying several sub-projects which further focussed on specific topics related to energy efficiency and climate change, for instance communication on energy efficiency, low energy buildings, training or incentives. 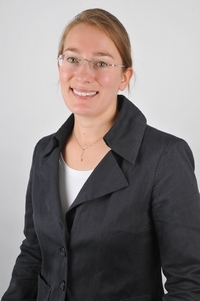 Amongst other topics, Saxony´s field of competence within EnercitEE “energy efficient buildings” was successfully evolved and existing know-how transferred to other regions by experience exchange on partner and on sub-project level. Many Saxon municipalities were encouraged by EnercitEE to further strive towards more energy efficiency or to set this topic on their agenda in the first place. The following numbers illustrate the broad effect, EnercitEE had with its many activities in whole Saxony: 26 municipalities and 3 rural districts, 2 universities and the Saxon Energy Agency were directly involved either as a partner in one of the ten sub-projects Saxony participated in or as actor being trained etc. More than 1.660 people participated in workshops; public information events, seminars and study visits and more than 20 publications, guidelines and training materials were developed. Activities and results proven successful within EnercitEE are included into the action plan of the combined Saxon Energy and Climate Program or municipal strategies. Additionally, some of them will be considered during setting up the framework for the new European funding period 2014-2020 on regional level. 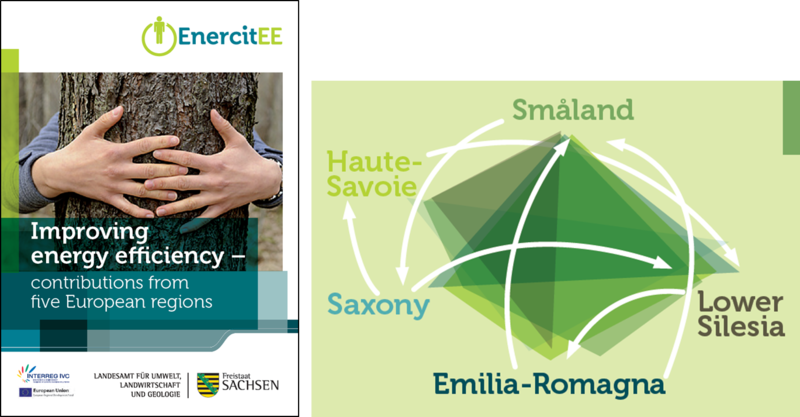 EnercitEE´s great success in Saxony will endure beyond the project´s duration: many initiatives that have been started within a sub-project will be continued and further developed - a long lasting effect as a sign of a valuable and fruitful project! When the region of Lower Silesia was asked a couple of years ago to participate in a joint application for an INTERREG IVC project on energy efficiency, nothing was really clear and easy. Back then mini-programs were a mystery and Lower Silesian municipalities looked at the energy-related initiatives with a lot of suspicion. So we felt there was definitely hard work before us. Now, towards the end of the project, we can strongly say that we succeeded. We managed to involve Polish municipalities in eight different sub-projects, providing them with co-financing and guidance throughout the duration, to reach tangible and lasting results. Regional and local policies were highly influenced by recommendations generated either by sub-projects or external experts taking part in project seminars. Various meetings, e.g. working groups, interregional symposia, study visits and training sessions, helped to bring people together to confront their own views and get acquainted with new solutions, as there is nothing better than personal contact. The project also produced different useful publications, of which the Good Practice Guide and the Final Handbook are especially noted. The quality of cooperation is another story. The longer the project’s duration, the more probable that something might go wrong. Fortunately, this was not the case with EnercitEE as all the partners were very open and willing to help at all times. There was always opportunity to learn something from each other, which kept the cooperation running at high level. Undoubtedly, the project effort was well worth it. 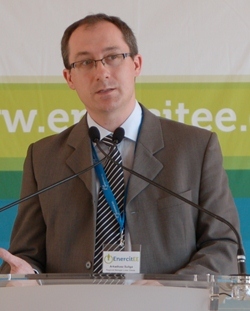 We have the impression EnercitEE is really paving the way for Lower Silesian local authorities to undertake energy efficiency activities in international partnership with EU funds. Our feedback is that the municipalities will definitely look there for potential ventures and inspiration. Being the regional authority, that seems the biggest achievement for us. From an uncertainty, a lack of knowledge and the doubt to comprehension, we reached appreciation and involvement. We surely have gone a long way. This final edition of the EnercitEE newsletter is an opportunity for INTERREG IVC to look back at what the project has contributed to the programme. 'Regions of Europe sharing solutions' is the tagline of the interregional cooperation programme, and nowhere is this more evident than in projects such as EnercitEE. Regions with different approaches to energy strategies, all facing the same challenge to meet the 20-20-20 energy targets, worked together to find the most adapted responses. At INTERREG IVC, we call this 'learning by sharing'. Interregional cooperation is one of the most effective tools available for regions to improve their own policies and instruments, without starting from scratch. We are happy to see that the EnercitEE results have surpassed some of their initial targets: more good practices were identified, more staff members increased their knowledge in this domain than previously envisaged and the project has resulted in several spin-off activities. Even more than that, we are delighted to see that at least five regional policies have been improved. 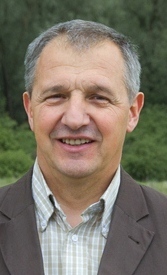 For instance, the Regional Development Strategy of Lower Silesia has been subject to a major update in 2012. Thanks to the EnercitEE partners, the new strategy includes the suggestion to establish a regional energy agency. For the programme, this is a clear example of the benefits of cooperation. These remarkable results would not have been possible without the extremely committed regional partners of EnercitEE which mobilised 47 sub-project partners in 11 sub-projects. We also had the chance to witness personally the high professionalism and very warm and friendly cooperation spirit of the partners during the meetings that we had the opportunity to attend. The EnercitEE partnership was one of 204 interregional cooperation projects financed - a select group considering the programme received more than 1350 applications in the 2007-2013 period. In total, more than 2350 public organisations are involved in cooperation projects across ten different thematic areas. Given the 'critical mass' of projects and partners dealing with similar issues, the programme set itself the objective to capitalise on the good practices identified by the projects it finances. The programme thematic capitalisation exercise focuses on collecting, analysing and disseminating the thematic knowledge gained from projects working on the same topic. The aim is to exploit the resulting knowledge for the benefit of local and regional authorities across Europe, and to help policymakers have a better impact at local, regional and European levels. EnercitEE was one of 12 projects working in the domain of ‘Energy Efficiency’. The good practices identified by the EnercitEE partners, and others, were subject to expert analysis and benchmarking. 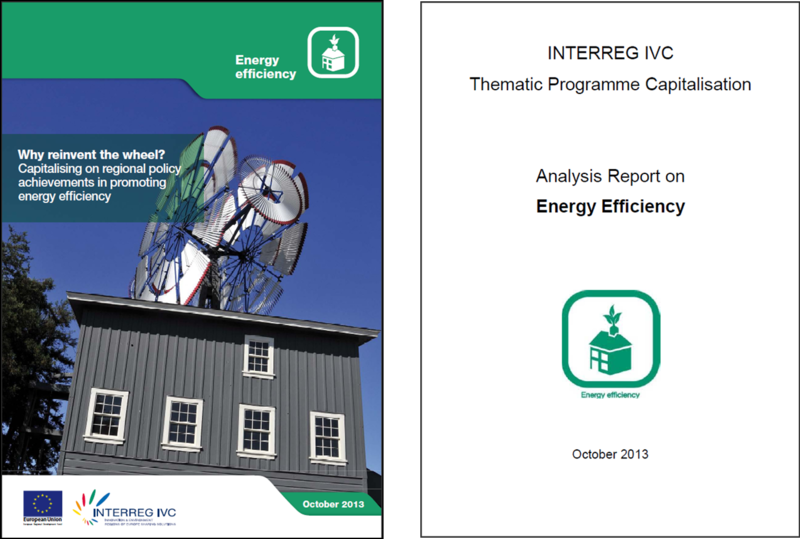 After one year, the first report – available at www.interreg4c.eu/capitalisation – provides a comprehensive state-of-the-art of energy efficiency policy in Europe. Several EnercitEE good practices are highlighted as particularly beneficial for other regions. We would like to thank all EnercitEE partners for these valuable results and in particular for the very good and enjoyable cooperation over the past 4 years. Do you think it is difficult to take part in EU-projects? 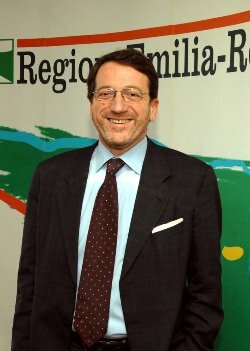 Does your municipality lack means to handle the administration of EU-projects? Taking part in a mini-program could be the solution. The administration is rather simple and a regional partner supports you in the implementation and in reporting process. This possibility was given within the EU-program INTERREG IVC during the current period. EnercitEE had 11 mini-program sub-projects where local authorities and organizations could cooperate and exchange experience and improve local and regional Energy Efficiency policies. The projects targeted either citizens or local authorities. More than 20 local partners, NGO´s agencies and local authorities, from Germany, France, Poland, Italy and Sweden participated in this mini-program. Most of them had no previous experience from EU-projects and being part of a large EU-project has given them knowledge and courage to continue in other EU-programs. For some of them it was also a wake-up when it comes to mitigation and adaptation to climate change. And experience showed that even with some initial reluctance coupled with disbelief present this issue was quickly accepted as part of a foremost mission to constantly increase the general standard of peoples’ living. European Territorial Cooperation programs offer a unique opportunity to implement certain activities on a smaller scale. Your municipality does not have to dedicate substantial resources nor base their whole future on the uncertainty of a project’s outcome. It is instead a form of assistance to support you in your regular activities and “probe” new solutions and schemes to be expanded later on. Therefore it is strictly advised for municipalities to take an active part in European projects. Look at the 11 EnercitEE sub-projects and their participants. The experience and the know-how they gained will not be forgotten – they will be the carriers of their future actions. Can you afford falling behind? Who knows what new conceptions and ambitions a cooperative project might give rise to in the end? Something that might have never been planned or discussed before - maybe a new vision? In July 2013 a delegation of EnercitEE project partners visited Emilia-Romagna/Italy and its best practices in the area of Ravenna. To begin with, the delegation was traveling on board Mhybus, an innovative bus fuelled by a blend of 85% methane and 15% hydrogen, which allows significant savings in fuel consumption and reduction of CO2 emissions. This bus is the focus of the LIFE+ project Mhybus, which involves the Region, ASTER, SOL S.p.A. and START Romagna. The goal of the project is to increase efficiency and sustainability of public transport by using hydromethane for public transport vehicles. The bus has now travelled for more than 45.000 km without technical problems, demonstrating that the use of hydromethane is feasible, and is now close to the definitive authorization to circulate with hydromethane. 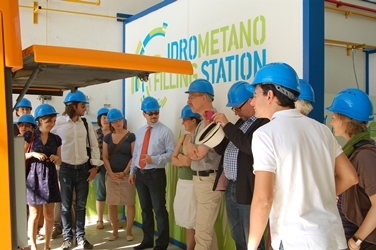 With Mhybus, the delegation reached the hydromethane fuelling station, designed and built within the premises of the hydrogen production plant of SOL S.p.A. in Ravenna. Here, a guided tour on the plant’s facilities and performances took place, highlighting the efficiency of the processes taking place at the plant. The visit proceeded to the research laboratories of Tozzi TRE, a company focusing on energy production from renewable sources: hydroelectric, wind, solar and biomasses. The research and development laboratory in Mezzano works on technological upgrades in renewable energy production and on hydrogen production and storage technologies. The delegation was shown some of the developed products: an hydrogen fuelled electric bicycle and special dye-synthesized photovoltaic cells, transparent to sunlight. Finally, the delegation visited Prato Pascolo, one of the largest photovoltaic plants in Italy. The project aims at joining sustainable energy production with the territory’s specific traditional vocation: the photovoltaic plant, one of the largest in Italy, with an area of 71 ha, is also a sheep grazing area. The photovoltaic plant produces 42 million kWh/year which are fed into the grid. This amount covers the demand of more than 10.000 families. If the same energy was produced by fossil fuels, about 23.000 tons of CO2 would be emitted. While the sheep contribute to the maintenance of the grass field below the panels, these create large shade areas for the animals. Next to sheep breeding, cheese is manufactured on site following traditional recipes: breeding and handmade cheese manufacturing respect biological agriculture criteria. The EnercitEE partners were given a small tasting session of the types of cheese produced and sold on site, which concluded the short tour through the best practices of Emilia-Romagna in Ravenna. Final Handbook "Improving energy efficiency - Contributions from five European regions"
ActEE "European Communication Tool Package"